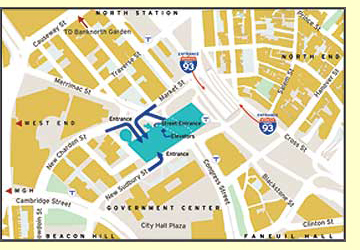 Whether you are visiting Government Center, Beacon Hill, TD Garden, the North End, Faneuil Hall or the Financial District; Government Center garage is just steps away, offering easy access to all major routes. Government Center Garage has two entrances and one exit located on New Chardon and New Sudbury Streets. The New Chardon Street entrance faces the new Edward W. Brooke courthouse and the West End. The New Sudbury Street entrance faces Government Center/City Hall Plaza. The garage is open and staffed 24 hours a day, every day of the year offering abundant parking on 8 levels. We offer a variety of flexible corporate and individual parking solutions to fit every schedule. Elevators are conveniently located at each parking level providing easy access to and from the ground floor lobby on Congress Street. The garage has a clearance of 6’ 2”. For your convenience and ease of exit, the garage features Express Exit lanes at each exit designed to accept credit card payments. No need to wait in line for a cashier, just scan your ticket, swipe your credit card as payment and Go! Click here for directions and a printable map. A true time-saver and headache reliever! Our Staff is available throughout the day to assist you with battery jump starts, tire inflation and car location. Simply tell one of the attendants or call the Garage Office at 617-227-0385.